I have always loved anything Ancient Egyptian, and when I saw this book on Amazon I thought I would give it a try. And man, this book to me on a roller coaster ride. I couldn't stop reading. I am really glad that I picked it up. Orphaned as a child, Irisi became a mercenary to survive. 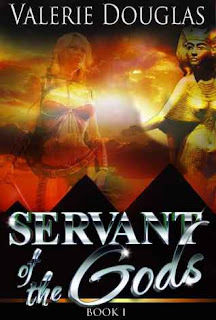 Captured by the Egyptian army and made the spoils of war, she finds herself drawn to their commander. Though the attraction is mutual even he can't save her from enslavement and she's forced to fight in the ring for entertainment. So this book is set 3,000 to 4,000 years in the past, in Ancient Egypt . It follows the story of Irisi, the High Priestess of HIsis. The opening scene.... the opening scene is of Irisi being mummified alive. I didnt know that was possible, and it was horrifying to think about, and sounds extremely painful. And then Irisi must say goodbye to her love, Khai, the only surviving general of the Egyptian army. The story then goes back to the beginning where you learn how Irisi and Khai met and what happened in between that moment and the mummification. So there will be a lot of spoilers ahead. So, go read the book now if you don't want anything ruined. I really loved this book and I cried reading it, at the beginning and the end (it was really awkward too, because I was reading it during one of my classes). This book is an amazing mix of history, ancient religion, culture, and magic. I think that the author does a splendid job of not only showing us details of the life of Egyptians, but also a peek into their religion and how powerful it was to them. Some of my favorite scenes were those that took place between the priests. I also thought Kamenwati was super creepy. The only think that detracted from the story was the obvious plot. I thought it was unique that we know how the story "ends", but the rest of the plot was pretty predictable. Kamenwati was very obviously the bad guy, there is no thinking needed to figure that out. And a sad plot point, that I can't hold against Douglas because this tore me apart emotionally (yay, we all know how much I love that), was that we know that no matter how great the love story is, Irisi will not end up with Khai, she will instead be mummified. I cried like a baby. So I guess I am saying I liked knowing she was going to be mummified, but I wanted a little more secrecy surrounding who the bad guy was. Something else that was confusing was the ethnicity of Irisi. She came from the north and she was very fair. The druids helped raise her and taught her some magic. She also incorporated Celtic knots into the protective charm necklace that she gave to Khai. So, she is from some Celtic place (Wales) so how did that happen? How did she end up in Egypt. I didn't know the Celts were raiding during that time period, I thought it was later in Egypt's history that that happened. That being said. I liked how different she was. I thought it added to her character. I just want to touch really quick on the lions that Sekhmet gave to her. They were so great, and it really broke my heart when the priests and priestesses decided to put them in the tomb with Irisi, to keep her company. They were turned into statues that would come to life when she called to them. It just made me start crying that they were so loyal they were willing to face eternity in a tomb with her, and then there was the fact that they would be her only company while everyone she had known would die and she wouldn't. As for the end, ugh, my heart hurts just thinking about it. Irisi was put in that tiny stele and was closed into the tomb, and Khai was expected to just be okay with it and walk away. I would never have been able to walk away. And the only time Irisi could come out was when someone was trying to break into the tomb, and even then she came out only to kill them before she had to go back into the dark. But!!! I was so mad when I read that Khai had had children. I understand that the woman he had children with was mourning her husband just as much as he mourned Irisi. And I get that he wanted to be a father, but he could have been a father with just one child! But he chose to have 4!!! I was a little skeptical and super pissed about that. Having read the second book I understand why he had to have children, but still, it made me want to punch something. That being said, it was really touching and heartbreaking how in every statue of himself he left an empty beside him where she should have been. And how he chose to put his tomb next to hers so that he could protect her from the afterlife. I literally wept when Irisi felt him die and then move on to the afterlife and she couldn't follow him. It was also sad how she felt so detached about it as well, and how she started to forget who she was and was trapped there forever in the dark. But there is a ray of light! She wakes up and confronts a tomb robber and starts on a new journey.